MOSCOW (AP) — Ukraine has announced a transport blockade of rebel-held areas that is likely to cause serious economic disruption and could threaten a precarious cease-fire in the east of the country. “It will be in place until the occupiers return stolen Ukrainian industry to Ukrainian jurisdiction,” Ukrainian President Petro Poroshenko told the country’s national security council in Kiev. The move represents a dramatic U-turn by Poroshenko, who had previously tried to end a transport blockade on the rebel east imposed by nationalist groups. It shows the government’s vulnerability to radical forces, which have increasingly shaped the nation’s policy agenda. Many economic links have been preserved between separatist-controlled areas that are dominated by heavy industry, particularly coal mining and metallurgy, and government-held Ukraine despite a three-year conflict. But the new measures appeared to amount to a full-blown trade ban. 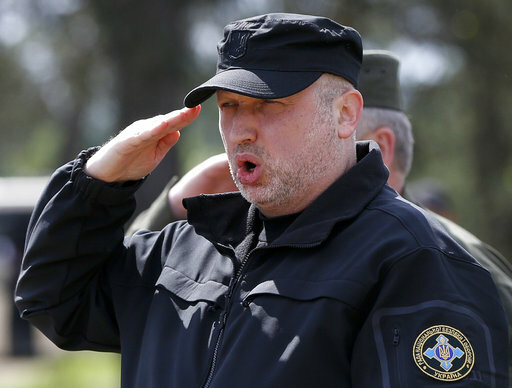 All rail and road connections with the rebel-controlled mini-states will be cut from Wednesday, National Security and Defense Council head Oleksander Turchynov told reporters, the Tass news agency reported. The only exception to the new blockade will be for humanitarian deliveries by Ukrainian organizations, the United Nations and the Red Cross. Poroshenko had previously criticized blockades on rebel-held areas imposed by nationalist activists, arguing that they hurt ordinary Ukrainians and drive residents of the east to join the rebel ranks. Russian Foreign Minister Sergey Lavrov denounced the move, describing it as “contradicting common sense and a sense of human conscience,” Tass reported. The German government also criticized the Ukrainian government. “From our point of view, such a decision doesn’t contribute to de-escalation: quite the contrary, it tends to encourage the separatist tendencies in Donbass,” Foreign Ministry spokesman Martin Schaefer said in Berlin, referring to the area of eastern Ukraine under rebel control. Activist blockades that began in January seriously hit trade on both sides, cutting off coal shipments to government-controlled territory and impeding deliveries from the mills and factories that are the east’s economic backbone. Ukrainian officials said they were contributing to rolling blackouts across the country and had inflicted millions of dollars of economic losses. Dozens of activists taking part in the blockade were detained by Ukrainian security services this week following clashes with police sent to disperse them. Nationalist activists in Kiev have also targeted Russian-owned banks, including a protest Monday during which they bricked up the Kiev headquarters of Russian-owned Sberbank. Rebel leaders in Donetsk said earlier this month that they had taken over the management of 40 factories and coal mines in retaliation for the blockade. They include those owned by Rinat Akhmetov, who is regarded as Ukraine’s richest person. Akhmetov’s Metinvest holding company on Wednesday declared a “complete loss of control” over its assets in the rebel-controlled territories. It said in a statement that it has decided to halt all operations at its industrial plants there in the face of the rebels’ actions. The blockade has exacerbated tensions in Ukraine, where fighting between government forces and separatist rebels has killed more than 9,800 people since April 2014. Geir Moulson in Berlin and Yuras Karmanau in Moscow contributed to this report.